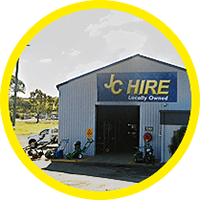 JC Hire is located on the Sunshine Coast, QLD, with branches at Warana, Maroochydore and Nambour. We supply a full range of equipment to the Home Handyman, Construction Industry, and Government. "It is our Mission to provide Sunshine Coast contractors with a convenient way to access reliable 24/7, top quality equipment that is right for the job, without the need for capital expenditure - backed up by 100% friendly customer satisfaction and the highest rating in the industry." - Paul Watson & The Team. Access Equipment: E.g. Boom Lifts, Cherry Pickers, ManLifts & Scissor Lifts. Earthmoving: E.g. Bobcats, Miniloaders, Excavators, Rollers, Conveyors. Building/Demolition & Renovation: E.g. Concrete Saws, Grinders, Nail Guns, Jackhammers, Compressors, Floor Sanders. Scaffolding: E.g. Aluminium Mobile, Painters Trestles, Planks & Ladders. Why hire instead of buy? It's impossible to have over 1,000 different machines in your garage! Paying up front for equipment can put pressure on critical working capital. Hiring equipment helps preserve cash for projects and expenditure that offer your business better returns. In most business cases, hire payments are fully tax deductible. Future resale risk is worn by us, not you! Right Machine For The Job. Seniors Cards are welcome at JC Hire. If you are a holder of a seniors or carers card, you will recieve a 10% discount applied to all hire items. Plus we give you extra special operator advice. So pop in and discuss your next project with us and enjoy the benefits of price and amazing friendly service. JC Hire is located on the Sunshine Coast, QLD, with branches at Warana, Maroochydore and Nambour. We supply a full range of equipment with competitive prices and the best service to the Home Handyman, Building and Construction Industries.